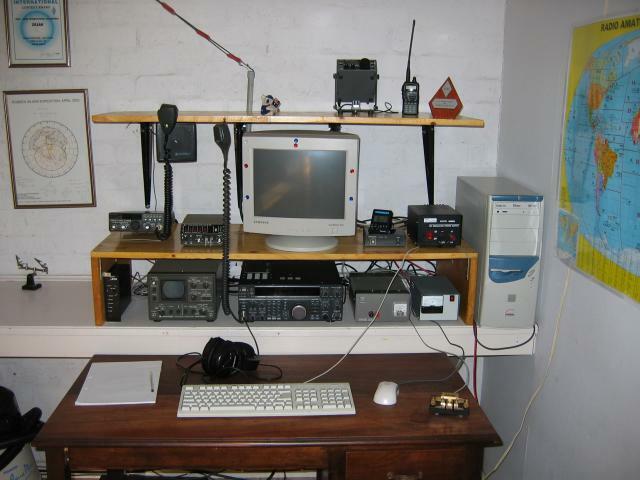 The picture shows the operating position in my shack. Bottom row (from left to right): packet TNC, Kenwood SM-230 station monitor, Kenwood TS-850S HF transceiver, PS-430 PSU and home-made battery charger for the 100 A-hr gell-cell that provides standby power. In the mddle: Yaesu FT480R all-mode 2m transceiver, Katsumi MK-1024 keyer, computer monitor, UTC clock, Kenwood IF-232 computer interface and auxilary power supply. On the top shelf: Force-12 balun feeding ladder line for my Vee Beam, a small Koala Bear I got with my PIC programmer from the Australian company Dontronics, Elecraft K1 QRP rig with tilt stand and Palm-Radio mini paddle (used for portable operations) and Kenwood TH-G71E dual-band handy. My Kent iambic paddle is on the desk. The PC belongs to my wife Stacey but she is kind enough to let me use it for logging during contests! I run WriteLog for Windows and connect the PC to the rig using my home-built soundcard interface for CW keying (and the occasional PSK-31 QSO) and the IF-232, which allows my PC to control the rig and to obtain frequency and mode information from it. Other indispensible software is EZ-NEC for antenna modelling, ACE-HF for propagation forecasting and Eagle CAD for circuit design and PCB layout. 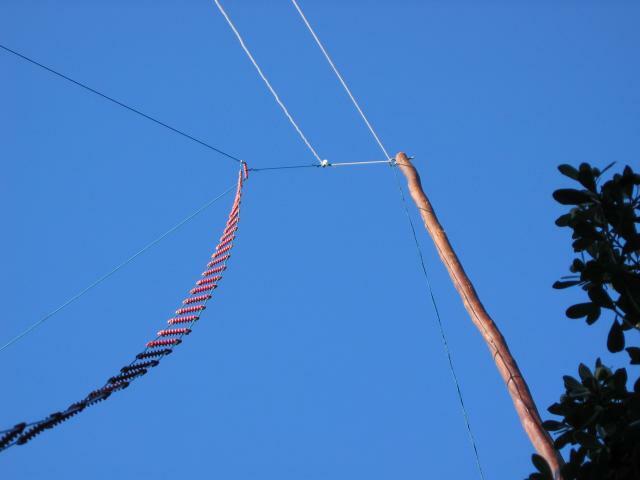 My current HF antenna is a multi-band Vee Beam with 23m legs and an included angle of 65 degrees, directed towards North America. On VHF I use a Bobtail Curtain mounted on the shack roof.